There has been a lot of research over the last eighty years or so into the nature of prejudice, group perceptions, and inter-group conflict. A lot of this has looked at the nature of racial conflict. Perhaps because the researchers were mainly white liberals a lot of the research has focused on white prejudice towards black people. This may even have given rise to an unexamined assumption both within the research and in the conclusions emerging from it that racial discrimination and prejudice are predominantly a white problem. The possibility that black people could feel prejudice and would act in discriminatory ways towards white people was not even considered. Marxist intellectuals are fond of claiming that science is “socially constructed” and perhaps they would be correct in this instance. Whilst all these factors are important in the understanding of inter-group conflict and the attitudes associated with it, there may be something more fundamental at work. Henri Tajfel (1971) undertook a series of studies into what are known as “minimal groups”. The proposition is that the mere perception of the existence of another group can itself produce in-group preference and out-group rejection/hostility, possibly the ultimate foundations of discrimination. He argued that before any discrimination can occur, people must be categorized as members of an in-group or an out-group. This makes categorization a necessary condition for discrimination but, more significantly, he found that the very act of categorization by itself produces conflict and discrimination, which makes it simultaneously a sufficient condition. The discoveries of Tajfel’s research are remarkable; he found that when people are separated arbitrarily into groups, groups stripped of all distinguishing features, even when they know they have been allocated to their group at random, they still develop in-group preference and out-group rejection. Even when subjects were shown their allocation to their group on the basis of a coin toss, they still showed a strong in-group preference. These findings have been replicated many times using a wide range of subjects from different age groups, different countries, and different cultures. The results are always the same: strong in-group preference and out-group rejection. I’ll be returning to this important research. Islam will tend to foster inter-group conflict by marking its adherents so distinctly by their dress-codes. It is virtually impossible to see Muslims as anything other than a discrete group, as outsiders, and once you learn something about Islamic attitudes towards non-Muslims, the conflict is all the starker. The converse is also true: Muslims by being a very distinct in-group to themselves, will see non-Muslims as outsiders very strongly. In 1968 she told her class of nine-year-olds that brown-eyed people are more intelligent and “better” people than those with blue eyes. Brown-eyed students, though in the minority, would be the ‘ruling class’ over the inferior blue-eyed children, and given extra privileges whilst the blue-eyed children were to be ‘kept in their place’ by such restrictions as being last in line, seated at the back of the class, and given less break time. They also had to wear special collars as a sign of their low status. The brown-eyed group adopted a superior attitude to the blue-eyed children becoming oppressive and mean and making derogatory statements about them. Elliot’s experiment was clearly building on the strong tendency (that minimal groups research indicates that we have) to take a more negative attitude towards an out-group, but this time some of the more typical furnishings are added: different physical features; superiority; rules of behaviour based on group membership; power differences. We abhor this behaviour and yet we all have a tendency towards it. Elliot has gone on to become a crusader for “diversity training” and a strong embodiment of “white guilt”. She is a fervent believer in the self-censoring watchfulness that we have come to define as political correctness. She believes that racism is in the eye of the beholder and therefore one need be ever-sensitive to the possibility of giving offence. "Perception is everything," she says. "If someone perceives something as racist then I am responsible for not saying that thing." Racism-in-the-eye-of-the-beholder is possibly one of the most noxious and illiberal concepts currently adopted by diversity enthusiasts. Whatever underlying concern for the underdog motivates this puritanical thought training, there is a very unpleasant sense that those deemed to be in the “wrong group” from Elliot’s perspective (e.g. Whites) will get very rough treatment. At her workshops, Elliot has demonstrated great verbal ferocity towards those in the “wrong” group, which would seem to bear this out. People like Elliot give one a sense not of someone who has transcended racism but rather of someone who has inverted it. Minimal groups research would seem to show that however enthusiastic you might be to escape the in-group/out-group trap, you are very unlikely to succeed. I also think that liberals are in an impossible dilemma when they try to apply this sort of framework to different cultures, and Islam in particular. It is within the paradigm of diversity training and anti-racism that a lot of liberal thinking regarding Islam is cast. There is for example the view that perception is hugely important: regard people more positively, without prejudgement and as equals and relationships will improve and we can enjoy harmonious social relations with people who may have some differences but between whom there is equal respect. Simple ethnocentrism is the attitude that one’s own culture is better than all others and that there is little of value on offer from cultures other than one’s own. There has been a widespread dissemination of the idea that ethnocentrism is wrong. Again, within the paradigm of people like Elliot, ethnocentrism is our problem in the sense that we have to avoid seeing our culture as superior. We don’t have to concern ourselves with ethnocentrism being directed at us. Our concern should be limited to reducing our in-group preference. We can do this by seeing all cultures as equal and as having equal validity relative to the group members of each culture. To start talking about the virtues of our culture relative to another risks a slippage into the in-group/out-group trap and all the discrimination and associated horrors that come in its train. Liberals like Elliot are certainly right to warn us about in-group preference and ideas of superiority. They are right to see the in-group/out-group dynamic as a potential source of error (really massive error in some cases). The Nazi treatment of the Jews is probably the most memorable case but there have been all-too-many others: the Armenian genocide carried out by the Turks (and which is still not acknowledged in Turkish society), the Rwandan genocide, the ongoing Sudanese genocide of Christians, Animists, and non-Arab Muslims, the list goes on. These "markers" are associated with other concepts: White, western, wealthy are seen to belong with oppressor, dominant, arrogant, racist, imperialist, colonialist, selfish, exploitative. Dark, non-Western, poor are seen to belong with oppressed, underdog, humble, innocent, downtrodden, generous, exploited. Where the pattern does not fit too accurately, information can be filtered in or out so that it does fit. In fact, getting the Liberal Template to fit, to impose it as it were, can become the main focus. The liberal wants to see the world in terms of the liberal template because he knows his place within it and it is a virtuous one: he fights the oppressive qualities of his own in-group. The classic case of the liberal template being misapplied is Israel. Israel is a small ethnically diverse, democratic country, which is tolerant towards minorities and progressive with respect to homosexuality, colour, class, gender, and different religions within its borders. It is located in the midst of hostile, reactionary neighbours and should be supported by liberals. It even gets accused of Apartheid, a prime liberal tactic to demonise an entire country. Why then is it the object of so much liberal vitriol? I would argue that it's due to the liberal template. Remember the difference between "seeing-that" and "reasoning-why"? Like the Muller-Lyer Illusion and the Old/Young woman image (see Parts 1 and 2), the liberal template imposes a pattern on the Israeli situation that overrules the use of evidence and reason. All the liberal sees with respect to Israel is Western/wealthy versus non-Western/poor. The former is the oppressor, the latter the oppressed. Contrary information is filtered out both by the imposition of the template and in order to maintain it. As a result, the liberal ends up in the absurd situation of supporting the very reactionary forces that he claims to be against at home. The archetypal form of the liberal template is European colonialism and the Atlantic Slave Trade. This was the classic case of white people full of ethnocentric self-belief and arrogance using their (superior) technological know-how and organisation to conquer people in an (inferior) state of development. The self-serving justifications employed to define black people as inherently inferior, like animals, and not worthy to be treated any better, are key examples of the way belief and ideology are easily used in the service of in-group objectives. All this is fine but there is an emotional force at work too which does not want anyone muddying the waters with evidence or argument that does not fit the template. Here’s where the selective nature of attention, perception, memory and all those other thought processes comes in – the cognitive mission – which are employed not to check whether the liberal template is in fact correct but to defend it. The liberal template is highly energised for self-protection not fact-checking. However, I think their view of this is incomplete, dangerously incomplete. I defined simple ethnocentrism above. There is another type of ethnocentrism that is more subtle. This type of ethnocentrism, let’s call it liberal ethnocentrism, is generally well-informed of the dangers of simple ethnocentrism but it falls into ethnocentrism all the same. Whilst not making negative judgements about other cultures and being always at the ready to value and accept people from different cultures, this type of ethnocentrism fails to acknowledge that the world views of these alien cultures could actually be built on completely different foundations to those of the liberal subject and may indeed share no common understandings or assumptions. This liberal ethnocentrism is so focused on eliminating simple ethnocentrism that it fails to see the profound simple ethnocentrism of the alien culture. Rather, the liberal assumes that the members of these cultures are just as ready as he is to reciprocate his respect for their culture. But when they aren’t, they can readily take advantage of his naivety. The liberal ethnocentrist naively believes that because he is accepting towards outsiders, they will treat him well too. It's like the innocent explorer accepting an invitation to dine with cannibals. Liberals (back to the wider sense of the word I set out in my introduction) have become accustomed to the idea that whilst they have had the upper hand they have done many wrongs towards people in weaker positions. They (or rather their fellow in-group members) have been the ones doing the oppressing; they are the ones who need to correct their view of outsiders in order to be fairer towards them. This way of thinking has become deeply ingrained in our culture. It begins in the early years of child-rearing and education. 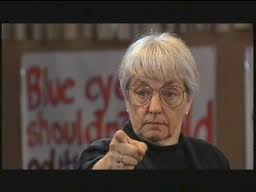 There has been an army of teachers like Jane Elliott at work since the 1970s. With all the focus on “the white problem” and the effort to reduce racism, out-group rejection, and ethnocentrism something of enormous importance has been missed: out-groups to us may feel in-group superiority for themselves. This is certainly true with respect to Islam and Muslims. I have a further question: how do you feel about a very ethnocentric culture displacing a less ethnocentric culture? The thought processes of liberals are a great puzzle, and I am enjoying the lessons in reasoning. I hope you can arrive at a means of jolting them to their senses. I believe that people cannot avoid being biased, the best that can be done is to be aware of our biases so that we are less fooled. It seems to me that liberals enjoy being fooled and seek out leaders who are skilled liars - I believe they are much biased by getting pay-checks out of their foolishness and they enjoy masturbating their egos excessively. Due to their dominance of educational accreditation, news media, the bureaucracy, the legal system, and most forms of looting the government(NGOs) it is very difficult to get fascism-opposing ideas in front of collectivists - I think what is needed are short aphorisms that can fit a bumper sticker or be yelled at a mob. But your reasoning is very enjoyable and educational. Thank you, & please keep up the good work! Is Friday The Deadliest Day?